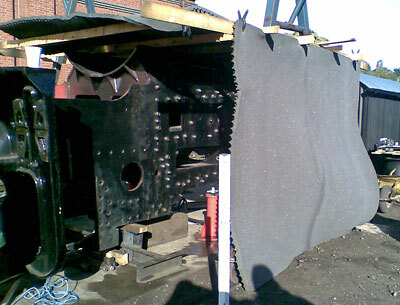 The liner plates around the four chassis lifting holes have been riveted in and work has started on riveting the smokebox saddle into the chassis. The rivets through the saddle into the main frame plates are cold rivets which we are manufacturing ourselves in the lathe from round bar stock. This all takes time. We are making a decent sized handful and then fitting them before repeating the process again, meaning that only relatively short riveting sessions are taking place at any one time. This helps to keep these noisy sessions brief and mindful of our neighbours we have rigged up a basic work tent of sound proofing foam in order to dampen the noise somewhat. The countersunk head in the main frame plate has to be a flat surface upon completion to allow for the fitting of the cylinders. 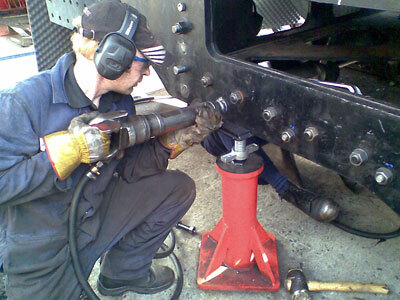 The rivets attaching the smokebox saddle to the stretchers in front of it and behind it are hot rivets. These stretchers will be returned to the inside of the chassis once the rivets in the side of the smokebox saddle are completed. 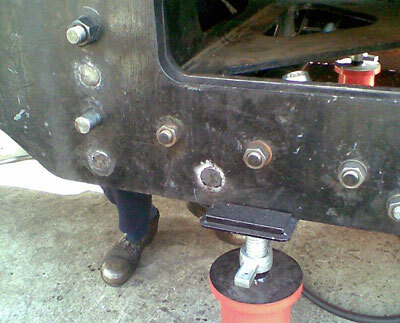 Rivets have been the main focus of attention in the last couple of weeks although work continues on the brake hanger brackets. They are off the lathe and will be on the milling machine shortly. An article written by the Trust's Assistant Publicity Officer, Paul Anderson, is due to appear in Heritage Railway magazine later this month. Paul was a fireman with BR at Nine Elms from 1963 until 1966 (he left because he couldn't stand the accelerating run-down of steam on the SR), and worked on many examples of the 82XXX class, many of which gravitated to the London shed towards the end of their careers. He loved the tanks, and his article makes fascinating reading. This sort of first-hand experience is, alas, becoming increasingly rare as the days of steam recede further and further into the past (an unbelievable 44 years last month since the last fire was dropped in everyday BR service!). The article is accompanied by a full-page advertisement with cut-out appeal coupon, which we hope will bring in some new members from outside the SVR as well as within it. A good opportunity for readers who haven't yet succumbed to become a part of the 82045 project and help speed the new loco on her way! We will be out in force, at Bridgnorth and Kidderminster, throughout both the Autumn Gala and Members' & Shareholders' Weekend (13th and 14th October). Please come along and make yourself known to us if we haven't yet met! Soundproofing foam around the smokebox saddle. 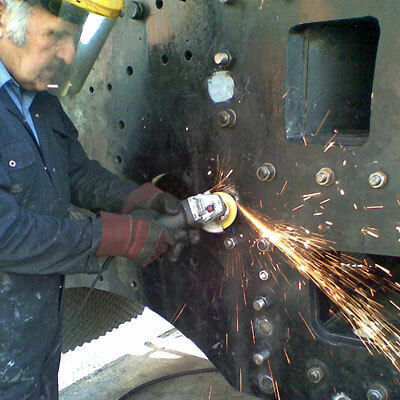 SVR Boilersmith Ross Cooper and Tony (underneath) closing a rivet. And finally - Colin grinding off the excess.